Map Nomads is a travel and adventure blog with a passion for creating everlasting instants around the world. With so many amazing things to do in the Thai Islands, it’s hard to choose which ones are the best to make the most out of your trip. So, to help you, we've compiled a list of the top experiences in the Thai Islands you absolutely cannot miss. 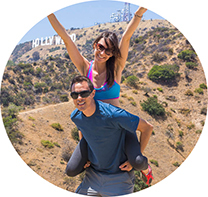 We’re Isaac and Daniela, avid travelers and adventure seekers with an obsession for creating everlasting instants around the world. We’ve lived in Mexico City, Barcelona, Washington DC, Orange County, and are currently on a one-year journey from Australia to Mexico. On our wedding vows we promised to explore the world together. Follow our journey as we try to honor that promise, one adventure at a time. Get new posts in your e-mail! Copyright © 2015 MapNomads All rights reserved.